Virgin Galactic's SpaceShipTwo, VSS Unity, flew higher than it ever has before on Thursday, surpassing what the US Air Force considers the boundary of space, and marking the first manned flight to space from US soil since 2011. The brief, suborbital flight -- with two pilots on board -- was a key milestone for the company headed by British tycoon Richard Branson, who is striving to send tourists to space at a cost of $250,000 per seat. Since then, the world's space agencies have relied on Russian Soyuz rockets to ferry astronauts to the International Space Station. "Today, for the first time in history, a crewed spaceship, built to carry private passengers, reached space," Branson said in a statement afterward. "This is a momentous day and I could not be more proud of our teams who together have opened a new chapter of space exploration." 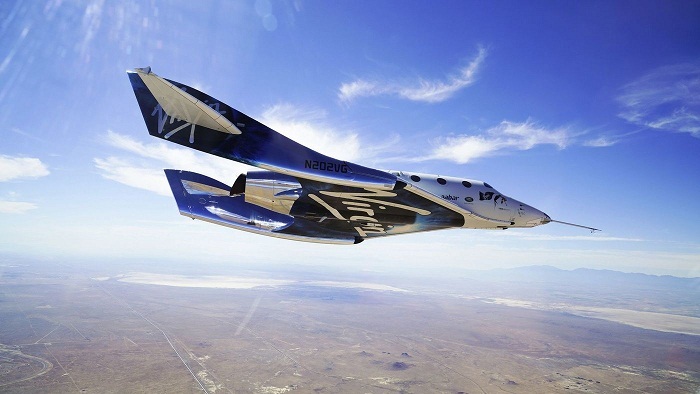 Virgin Galactic's spaceship did not launch on a rocket but took off attached to an airplane from Mojave, California. "We made it to space," the company said on Twitter. Virgin Galactic has said it would use the US Air Force's definition of space as its standard. "What we witnessed today is more compelling evidence that commercial space is set to become one of the 21st century's defining industries," said George Whitesides, CEO of Virgin Galactic and The Spaceship Company. "Reusable vehicles built and operated by private companies are about to transform our business and personal lives in ways which are as yet hard to imagine." The US space agency paid Virgin Galactic to fly four space science and technology experiments on the VSS Unity, "making this Virgin Galactic's first revenue generating flight," the company added. "Congrats to @VirginGalactic on SpaceShipTwo successfully flying to suborbital space with our four @NASA_Technology payloads onboard," NASA said on Twitter. "With a good rocket motor burn, the mission went beyond the 50-mile altitude target." The first crew tests of SpaceX and Boeing's astronaut capsules are expected next year. Virgin's first flight date had been pushed back multiple times, following a test flight accident that killed a co-pilot in 2014. The Federal Aviation Administration's acting head Dan Elwell commended Virgin Galactic on its successful flight. "Commercial space has great potential for American economic and innovative leadership," Elwell said. "We are pleased that Virgin Galactic is among the many pioneers of space flight helping write a new chapter in aerospace history."